XYLIPUR® Bio Xylit Sticks are always there: in the handbag, in the café, in the kitchen, on the Berghof or for the Strandcappuchino. For dental care in between or to sweeten drinks. The sticks look good in any situation, look great and the xylitol has all the benefits of Xylipur organic xylitol. Ideal for carefree enjoyment in baking, cooking and sweetening delicious sweets. The organic quality is guaranteed by our organic certification body. 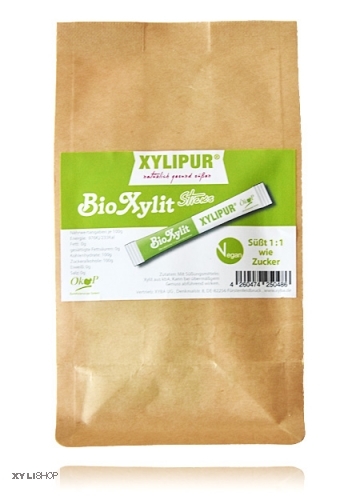 XYLIPUR® Organic Xylitol is granular like traditional saccarose sugar and can be dispensed just as comfortably. This is how your baking and cooking recipes succeed especially easily. For XYLIPUR® Bio Xylit we only use selected qualities with round sweetening power. XYLIPUR® Bio Xylitol - also commonly called "birch sugar" - is one of the sugar alcohols, is a natural sugar substitute and is found in practically all plants. Xylitol is extracted from xylose (wood sugar). Its special formula C5H12O5 contributes to the fact that the acid in the mouth is largely neutralized. Acid damages tooth enamel and can lead to tooth decay. In addition, the enamel is remineralized. Many other positive attributes have been attributed to xylitol over the past 30 years. Xylitol is formed in the metabolism of the human body itself and is therefore 'known' to the human body. Xylishop says: "Organic quality in handy stick portions, ideal for gastronmie or for the long-term need in the favorable advantage pack." * certified organically grown, certified by the Ökop Certification GmbH. Note: May be laxative if consumed excessively. Wohlschmeckende Minz-Zahnpasta mit Xylit. 75ml Tube. Schützt und pflegt Ihre Zähne und das Zahnfleisch mit einer speziellen Formel basierend auf Salbei, Myrrhe und Xylitol. Wirkt auch gegen Zahnstein und Paradontose. Frischer Atem durch Pfefferminzöl. Die Xylit Zahncreme für extra sanfte aber gründliche Reinigung bis in die Zahnzwischenräume dank natürlicher Putzkörper aus echter Kreide. Fluoridfrei. Milde Xylit Zahnpasta speziell für Kinder, homöopathieverträglich mit 13% Xylitol. 50ml Tube. Schonende und gründliche Reinigung der Milchzähne. Mit Fluorid in geringer Dosierung (500ppm).Mildes Kieselgel als Putzkörper. Xylit 'Milch' Schokotropfen. Milde, vollmundige Schokolade - aber ohne Milch stattdessen mit mit Soja. 100% vegan und glutenfrei. Schöner runder, leckerer Geschmack. 300 g im Vorrats-Kraftpapierbeutel - natürlich aluminiumfrei. Nur mit Xylit gesüsst (20%). Eine willkommene Alternative für süße Naschkatzen.